XR and spatial computing haven’t met their public yet in Switzerland. Decision-makers are not informed about the power of these technologies. The SSVAR (https://ssvar.ch) is an independent Swiss association dedicated to promoting VR/AR/MR and Spatial Computing across the country. It is managed by a team of pros in VR, AR, MR, creative and technology business incubation, computer vision and artificial intelligence. 2019 will be the third year of the association. We have 215 members registered and a large online community. A shared workspace to research and develop Virtual, Augmented and Mixed Reality technology, applications and projects. Renting of high end equipment, to help them develop their projects with a small budget. Vertical thematic workshops (by sector of activity) for professionals, technical meetings and public events. AR /VR/MR & Spatial computing technologies training center for pros. Schools children initiation to XR. Opening in January 2019 in Satigny (near the CERN, Geneva) with our partner SpookLight Studio. Talk about the concept of ICAV by showing the kind of technologies we’re promoting. We believe that spatial computing and mixed reality are the next computer platform. 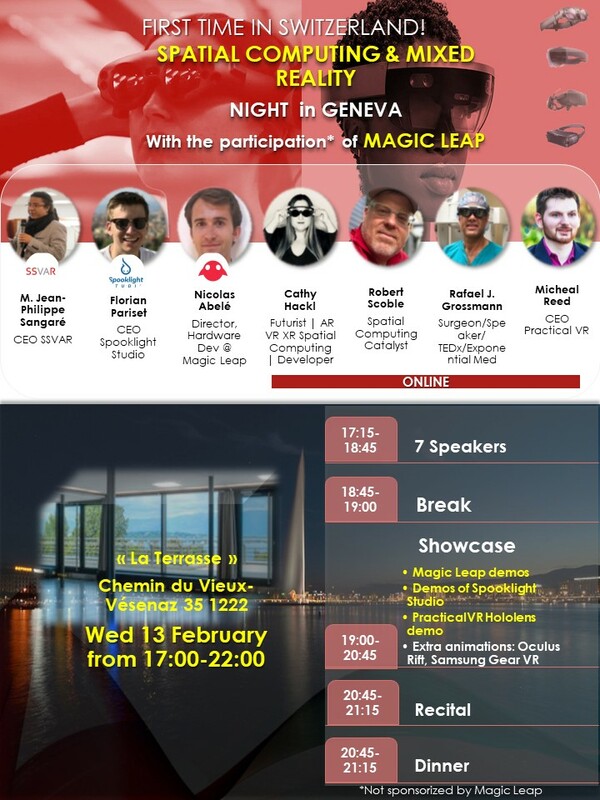 We'll present also Microsoft Hololens, and some virtual reality applications with Oculus Rift and Samsung Gear. Come and join us for this very special event to discover and learn more on this new technology!